Business Loop I-90 (Main Street) looking south toward the intersection with Brundage Street in Downtown Sheridan. Photo taken August 7, 2016.
Business Loop I-90 through Sheridan runs south along North Main Street with U.S. 14-87 Business to Downtown. Coffeen Avenue angles the route southeast across Little Goose Creek to a commercial strip west of Exit 25. U.S. 87 Business ends as U.S. 87 combines with Business Loop I-90 & U.S. 14 Business east along Brundage Lane to Interstate 90.
Business Loop I-90 formerly branched south from Interstate 90 from a trumpet interchange at Exit 20 to intersect Wyoming 338 at Decker Road. The exchange and associated access road south were removed as part of the North Sheridan Interchange Project. Photo taken 08/07/16. North Main Street constitutes a five-lane commercial arterial through the north side of the city of Sheridan. Photo taken 08/07/16. Business Loop I-90 & U.S. 14-87 Business turn due south at East 17th Street (Sheridan County 82 east) and Fort Road (former Wyoming 337) west to the V.A. Medical Center at Historic Fort McKenzie. Photo taken 08/07/16. North Main Street southbound at West 16th Street in Sheridan. Photo taken 08/07/16. A second set of reassurance shields for Business Loop I-90 east & U.S. 14-87 Business south appear on the block ahead of 10th Street. Photo taken 08/07/16. Shields for WYO 330 west and WYO 336 east at 5th Street were removed by 2015. WYO 330 spurs west 1.1 miles to Kentucky Avenue near Rotary Park. WYO 336 travels 11.52 miles from Business Loop I-90 in Sheridan to Wyarno and CR 42 (Ulm Road). Photo taken 08/07/16. Main Street becomes more urban on the drive south from 5th Street (WYO 330 / 336) toward Downtown Sheridan. Photo taken 08/07/16. Passing below a skywalk at the Sheridan Center between 3rd and 2nd Streets on Business Loop I-90 eastbound. Photo taken 08/07/16. Little Goose Creek flows around central Sheridan from the south through a channelized course. West of Main Street, the creek dumps into Big Goose Creek at Mill Park. Photo taken 08/15/14. Dow Street runs along the south side of Little Goose Creek east to Broadway Street and west to Lewis Street at Mill Park. Photo taken 08/07/16. Continuing south along Business Loop I-90 & U.S. 14-87 Business at Mandel Street. Photo taken 08/07/16. Alger Street loops south from Dow Street to Whitney Commons Park and east across North Main Street to Scott Street. Photo taken 08/07/16. Business Loop I-90 advances south to Grinnell Plaza east on the north side of Downtown Sheridan. Photo taken 08/07/16. Business Loop I-90 & U.S. 14-87 Business (North Main Street) at Brundage Street. Photo taken 08/07/16. Loucks Street separates north and south street prefixes in Sheridan. West from Vale Avenue, Loucks Street is Wyoming 331, which spurs southwest along Big Goose Highway to Beckton. Photo taken 08/07/16. One block ahead of the Business Loop I-90 separation with South Main Street at Works Street. Photo taken 08/07/16. Business Loop I-90 east & U.S. 14-87 Business south angle southeast from Downtown Sheridan along Coffeen Avenue. South Main Street continues as former Wyoming 332 to College Avenue. Photos taken 08/07/16. Trailblazers direct motorists along the remainder of Business Loop I-90 east back to I-90. Photo taken 08/07/16. Coffeen Avenue next intersects Perkins Street west and Whittier Street northeast to adjacent residential areas. Photo taken 08/07/16. A six-way intersect connects Business Loop I-90 (Coffeen Avenue) with College Avenue east and west, Illinois Street south and Lowell Street northeast. Photos taken 08/07/16. Sheridan Avenue extends south from Wyoming 330 (5th Street) across Little Goose Creek to cross paths with Business Loop I-90 (Coffeen Avenue) south to Wyoming 334 (Brundage Lane). Photo taken 08/07/16. Shield assembly for I-90 and U.S. 14-87 Business posted along Coffeen Avenue south after Sheridan Avenue and Heald Street. Photo taken 08/07/16. Coffeen Avenue curves southward across Little Goose Creek as a five-lane commercial arterial. Photo taken 08/07/16. Avoca Avenue stems east from Sheridan Avenue to cross Little Goose Creek ahead of Business Loop I-90 (Coffeen Avenue). Sugarland Drive ties into the signalized intersection from businesses and apartments to the east. Photo taken 08/07/16. Big box retail, car dealerships and other retail line both sides of Business Loop I-90 & U.S. 14-87 Business (Coffeen Avenue) at Sugar Lane. Photo taken 08/07/16. Advancing south, Business Loop I-90 turns in one half mile onto Brundage Lane for both I-90 and U.S. 14. Photo taken 08/07/16. Business Loop I-90 & U.S. 14 Business east combine with U.S. 87 north along Brundage Lane east. Unmarked here, Wyoming 334 follows Brundage Lane west to link Coffeen Avenue with Wyoming 332 (Big Horn Avenue) south. Photo taken 08/07/16. U.S. 87 Business ends as U.S. 87 overtakes Coffeen Avenue south from Sheridan toward Big Horn and Story. Photo taken 08/07/16. Sugarland Drive returns to end at Business Loop I-90 (Brundage Lane) east just ahead of Interstate 90. Photo taken 08/07/16. Entering the diamond interchange with Interstate 90, Business Loop I-90 and U.S. 14 Business end. Photo taken 08/07/16. U.S. 14 emerges from I-90 east to travel solo southeast 27.3 miles to U.S. 16 at Ucross. U.S. 87 north combines with I-90 & U.S. 14 west to Ranchester. Photo taken 08/15/14. Business Loop I-90 stems west from Exit 25 along side U.S. 14 Business & 87 along Brundage Lane. This sign stands at the north end of the westbound off-ramp from Interstate 90. Photo taken 08/15/14. Passing through the diamond interchange along Brundage Lane westbound. I-90 travels 32 miles southeast to Buffalo and 99 miles east to Gillette. Photo taken 08/15/14. Guide signs along the eastbound direction of I-90 acknowledge Business Loop I-90 leading back into Sheridan. Photo taken 08/07/16. The first shields for Business Loop I-90 & U.S. 14 Business appear along Brundage Lane west at Sugarland Drive. Sugarland Drive stems north through a business strip between I-90 and Coffeen Avenue. Photo taken 08/15/14. Business Loop I-90 & U.S. 14-87 Business turn north onto Coffeen Avenue from the succeeding signal on Brundage Lane west. Brundage Lane (WYO 334) extends 1.4 miles further to Sheridan County Airport (SHR). Photo taken 08/15/14. U.S. 87 travels south independent of I-90 from Sheridan to Banner and Story. Wyoming 335 branches southwest from the route to Big Horn. Photo taken 08/15/14. U.S. 87 Business overlays Business Loop I-90 northward along Coffeen Avenue to Downtown Sheridan. Photo taken 08/15/14. A second set of reassurance markers stand along Coffeen Avenue north ahead of Avoca Avenue. Photo taken 08/15/14. Sugarland Drive returns north to end at Business Loop I-90 (Coffeen Avenue) across from Avoca Avenue. Avoca Avenue links Coffeen Avenue with Sheridan Avenue. Photo taken 08/15/14. Business Loop I-90 curves northwestward across Little Goose Creek to an array of retail and restaurants. Photo taken 08/15/14. Coffeen Avenue converges with Sheridan Avenue north and south, and Heald Street east at the ensuing westbound signal along Business Loop I-90. Photo taken 08/15/14. Business Loop I-90 & U.S. 14-87 Business (Coffeen Avenue) enter a six-way intersection with College Avenue, Lowell Street north and Illinois Street south. Photo taken 08/15/14. Whittier Street angles southwest from parallel Wyoming Avenue to intersect Coffeen Avenue opposite Perkins Street. Photo taken 08/15/14. Reassurance shields posted north of Whittier Avenue on Coffeen Avenue. Photo taken 08/15/14. Coffeen Avenue turns westward to intersect South Main Street. Business Loop I-90 & U.S. 14-87 Business overtake Main Street north through the city center, while Burkitt Street extends west from Coffeen Avenue into neighborhood areas southwest of Downtown. Photos taken 08/15/14. 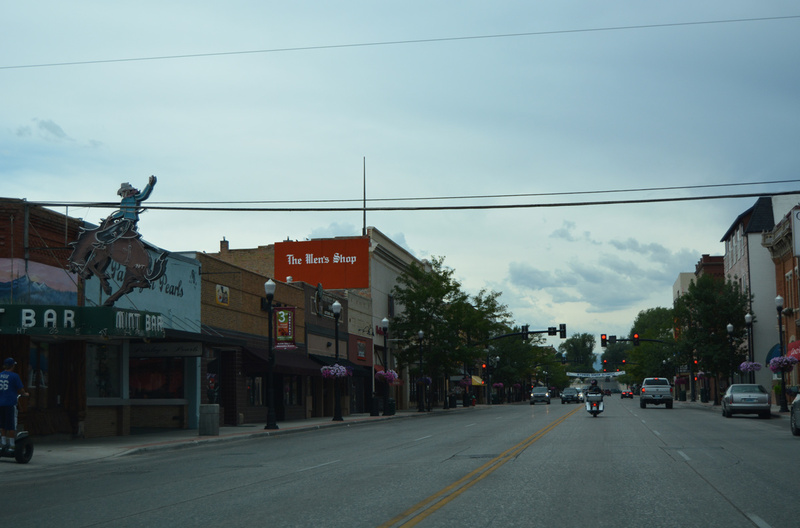 South Main Street accommodates four lanes of traffic across Downtown Sheridan. Pictured here are confirming markers at Works Street. Photo taken 08/15/14. Upcoming Loucks Street formerly was Wyoming 331 between Business Loop I-90 (Main Street) and Vale Avenue near Kendrick Park. The state maintained portion resumes there, taking Wyoming 331 southwest along Big Goose Creek to Beckton. Photo taken 08/15/14. Loucks Street ends four blocks to the east of Business Loop I-90 at Custer Street, with separate blocks both west and east of Little Goose Creek. Photo taken 08/15/14. The subsequent northbound signal along Main Street is at Brundage Street in the heart of Downtown Sheridan. Photo taken 08/15/14. Main Street north at Grinnell Plaza east. Photo taken 08/15/14. Alger Street crosses Business Loop I-90 (Main Street) west ahead of Fulmer Public Library and Whitney Commons Park. Photo taken 08/15/14. Business Loop I-90 west & U.S. 14-87 Business north at Dow Street. Photo taken 08/15/14. Dow Street lines the south side of Little Goose Creek west to Lewis Street at Mill Park. Photo taken 08/15/14. Looking east from North Main Street at the channelized waters of Little Goose Creek. Photo taken 08/15/14. A skywalk spans North Main Street at the Sheridan Center north of 2nd Street. Photo taken 08/15/14. 5th Street doubles as Wyoming 330 west from Business Loop I-90 to Sheridan Memorial Hospital and Kentucky Avenue. Photo taken 08/15/14. Wyoming 336 lines 5th Street east to Interstate 90 en route to Wyarno. Photo taken 08/15/14. Trailblazers for I-90 take the place of Business Loop I-90 for the remainder of the route north along Main Street. Photo taken 08/15/14. "WYDOT to start construction on $46.4 million North Sheridan Interchange project." Wyoming Department of Transportation (WYDOT), June 20, 2016. North Sheridan Interchange Project. city of Sheridan, Wyoming web site.